There's a very common comic-book writing technique focusing on the last panel on a page. The idea is that the last panel is incredibly important. People reach that panel, and they have two options. They can turn the page and see what's next. Or they can stop reading. Now, technically, you can stop reading at any point – but how many people stop reading in the middle of a page? Nobody does. You reach the last panel and you decide then. Therefore, you want that last panel to encourage the reader to turn the page. There is something exciting on the next page! You'll never know unless you turn that page! You have to see it! And, of course, once you do . . . well, you have to finish the page . . . and then, well, one more page won't hurt. Right? I imagine there's a similar concept involving movie scenes. It's not much of a stretch to imagine a playwright equivalent. Books are trickier, as there's no particularly obvious "common break point" besides the end of the page, and there are a lot of pages in a book. Extrapolating to video games isn't hard either. 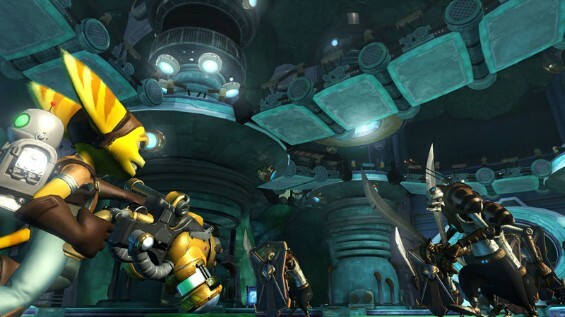 I've been playing Ratchet and Clank Future: Tools of Destruction. It's a science-fiction action game, broken up into somewhere around 15 levels. Each level takes place on a unique planet – you travel to a planet, walk around killing things, then travel to the next planet. There is almost no hook to keep you playing the game. Oh, sure, there's another planet out there. Maybe this planet has a superpowerful world-destroying device on it! Maybe the next planet will contain some crazy alien artifact! But you quickly realize that the plot of the game has no effect whatsoever on the gameplay. You could be playing Ratchet and Clank's Grand Tour of the Galaxy for all the gameplay cares. That superpowerful device? It'll only factor in as a plot point, it's not like you'll get to use it yourself. Crazy alien artifact? Bet it'll just tell you where another planet is! Oh look it did, guess we'll go there now. Ratchet and Clank is still a fun game, but I never once found myself saying "one more planet", "one more quest", "one more zone", because the only reward to "another planet" is the ability to go to the next planet. Start at point A, travel to point B. Find new planet. Repeat. It's a very linear game. Conversely, there's a game called The World Ends With You. 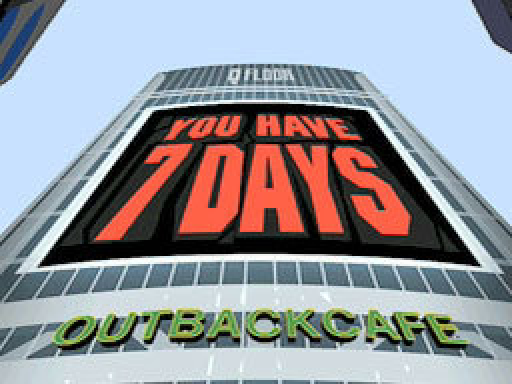 TWEWY is divided into "days". You have tasks to complete each day, and when you've finished them, the day ends, whether you want it to or not. Then the next day begins. There's no going back, at least until the end of the game. TWEWY goes to incredible lengths to put a hook on the end of each day. Sometimes it's just a plain cliffhanger ending. Sometimes it's such a huge cliffhinger you can't imagine how the game can even continue after the events of that day. Isn't, like, the game over? Aren't we done? No. No, you are not done. And sometimes – I love these – sometimes they show you half of the end-of-day events. Then the day ends, leaving you confused and wanting to know what actually happened. (Save your game! Continue to the next day? yes/no) The next day begins, and you get maybe five minutes of gameplay at most, and then they have a flashback to the section you just completed showing you what actually happened. And then the next day's plot seriously begins. But, wait, you're already playing the next day! You can't stop now. You'll have to wait until the following day to turn the game off. Start at the beginning of the day, go to the end of the day. Start another day. Repeat. TWEWY is an even more linear game than Ratchet and Clank is – and yet, it's far more interesting, and it does a far better job of making you want to play more. I'd argue that a lot of this is simply due to TWEWY's end-of-day hooks. When it comes to game design, it's easy to spend too much effort on the game design part itself. Combat mechanics. Stats. Interfaces. It's important to remember that, with few exceptions, games also involve plot and writing. Weak writing can kill a game, and we don't actually know much about how games should be written yet – so we'd better steal as much as we can from other mediums. I've been playing Disgaea DS, despiting killing it on the PS2. Heh. Disgaea was great in that respect, whether it was "just one more turn so I can beat this guy" or "just one more floor" or "just one more incredibly weird bit of plot once I get past this level". I still haven't touched Disgaea 2 yet :( I'll get to that. You know. Eventually. I've been playing Disgaea DS mostly because I can play during those long train rides.. One more "something"! I think in the PS2, there was a special item that requires all 100 floors to be played straight.. yaaaaa..
Disgaea 2 is fun, but didn't get me as hooked as the first one – though it might just be because during Disgaea 1 I was in college (tons of free time) while Disgaea 2 I played it more stretched out. Disgaea 3 is also out, but I don't have a PS3 and no immediate plans to get one, so there goes that. If there is one game that really does not need to be on PS3..
Civilization was the master of the "turn the page" hook. You had so many hooks coming at so many different paces. From turn-to-turn: What is just beyond the unexplored region? What Ancient Scrolls of Wisdom are in that hut? To short-term and long-term: How awesome will my army be after I learn iron-working? Or tanks? What new coolness will I get when I switch governments? Or finish building this world wonder? Can I send out a spaceship in 1820? I frequently stop reading in the middle of a page in a comic book. Or the middle of a chapter in a book – I'll finish one chapter, read two pages out of the next one, then put the book down. Ming: In a similar fashion, Diablo did the exact same thing. One more level/quest/elite monster/green drop! And, of course, World of Warcraft is currently the reigning king of eight billion hooks waiting for you at all times – another level, another talent tier, another quest, another quest *line*, another zone, another important skill, and then there's the Big Levels at 10, 20, 30, 45, and 58. I don't know if Civ or WoW has more hooks, but they're certainly competing in that space. I admit I didn't explain this well, but chapters aren't really common. Comic book pages happen constantly, far more quickly than one per minute. Book chapters tend to be a lot longer than that. Admittedly, game "segments" are slower too, but there's more immediate hooks keeping you engaged for the short-term (i.e. "I need to kill this enemy") which books can't do as much of. For me, hooks like this sometimes cause in me a feeling of addiction rather than pleasure. And the point of playing a game is (among others) to have pleasure, not to waste time which I could better spend working or learning. If the game is addictive, I would play it for long periods of time, yes, but after completing it, I might remember it as a waste of time rather than a good game — one that kept me by the force of addiction, not by giving me joy. Especially if the game has boring parts which I play only because I have to do them in order to get to the next hook. Of course, these hooks are important. But they won't replace good game mechanics, which are a source of pleasure for me. World of Warcraft is a great example of how RPG's keep people immersed in the fantasy, "What would I be able to do with more powers?" First Person Shooters rely on getting a new weapon (Quake). Strategy games rely on new units. And looking at Starcraft – YES, plot should integrate with functionality. Make a game where people choose how they play (the more variation the better, Spore?) – AND give them some competitive multiplayer context and watch the money come in.